When I lesson plan with teachers, out of earshot from their fellow teachers and their principals, I can't tell you how often I'm asked, "what exactly does it look like?" when it comes to differentiated instruction. In the education world, differentiated instruction is talked a lot about as a policy or as a solution, but rarely do educators get opportunities to roll up their sleeves and talk about what it looks like in practice. The definition begins with this: Equal education is not all students getting the same, but all students getting what they need. Approaching all learners the same academically doesn't work. We have to start where each child is in his learning process in order to authentically meet his academic needs and help him grow. With a classroom full of children at different stages of learning, this certainly sounds overwhelming, I know. So I'd like to suggest a place to begin and provide some examples. The fact is we are mainstreaming a larger number of our students to general education classes, who, 15 years ago, may have instead been assigned to a special education class. That's good news in so many ways but makes a teacher's job more challenging. This is also one of the reasons why differentiated instruction has become such a hot topic. Several years ago, in one of the general education language arts class I was teaching, 8 of the 34 students enrolled had an Individualized Education Program (IEP). When a child has an IEP, it is required that all teachers provide accommodations and modifications to assignments and instruction for that student. Speaking of overwhelmed. I definitely was, to say the least. So, I learned. I spent many of my conference periods combing through student files. It's amazing what you can discover about a child from doing this. For instance, I had a student with perplexing behaviors then I learned he suffered from schizophrenia. How did I find out? Looking at his file. I was a much better teacher for him after gaining this information. Of course, he had an IEP, and someone should have told me in the beginning of the year, but we all know how things -- and children -- fall through the cracks of large public schools in enormous school districts. Making an assignment, task, or objective different for one student than the rest of the class is meeting that child where they are in their learning journey. It's okay, you don't have to feel bad or feel as if you are being unfair, or lowering the bar. You are the child's teacher and you spend enough time with her to understand what she needs. And remember, equality is about meeting the needs of the individual. It's a high school language arts class, and students are reading a novel. The daily objective is practicing inference and application of this skill. They are writing a brief essay predicting what the character Crooks from Steinbeck's Of Mice and Men might do next. They must pull textual evidence from the book to support their predictions and claims. But Diana is seated over there, frustrated. She is struggling with the concept of inference, partly because she is reading below her grade level. Knowing this about her reading abilities, and other challenges indicated on her IEP, do I expect her to stay the course, or do I admit that success for her with this assignment as it stands is not likely? I decide to give Diana the task of listing five adjectives to describe the character Crooks. She has to find one quote from the character in the book to prove one or more of the words she has chosen. There are similarities to these two assignments, but different enough to ensure a higher probability of success -- and learning -- for her. 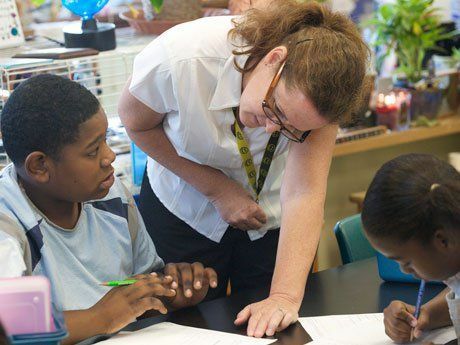 Differentiated instruction for Diana, and for other struggling students, may mean providing a handout with sentence starters or a graphic organizer to help them with constructing meaning. It may mean providing extra time to complete an assignment, giving directions again, reducing the length of an assignment, or offering alternate assignments or projects altogether. You can also provide struggling students with leveled text -- less difficult reading that contains the same content. Do I pre-plan variations of an assignment? Not always, but when I know my struggling students and their challenges well enough to predict road bumps ahead for them, I'm ready. One way to be ready? Create file folders filled with various graphic organizers, visual aides, and sentence starters for different types of thinking (cause and effect, chronological, compare and contrast, to name a few). You can quickly pull out one of these in a pinch. If a student finishes a differentiated assignment with time left, then assess if it was too easy, and add a step. If a differentiated assignment is too difficult, break down the directions even more, give them one-on-one time with you, or remove a step. I've heard teachers suggest that making an assignment less difficult for one student is not fair to the others. But I ask: Is it a matter of what is fair, or what is right? What are ways you differentiate instruction for the grade level and content you teach? We look forward to hearing from you!